Introducing the Eezi-Awn Bat Awning. An innovative design awning can be deployed by one person in less than a minute, creating 270 degrees of free standing coverage around your vehicle from a 4" x 6" x 86”PVC case. When deployed, the awning stretches 80" to the side, 84" from the corner, and 80" to the back of the vehicle. 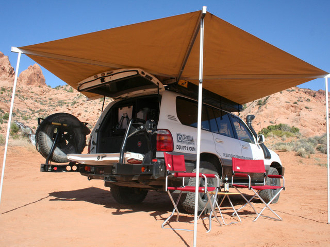 The Bat Awning features a full aluminum frame construction with waterproof rip stop canvas panels, integrated height adjustable legs, and left side or right side applications. A perfect solution for camping, sporting events or family outings. Dimensions, Closed 4" x 6"x 96"
Dimensions, Mounting Extrusion 4" x 90"